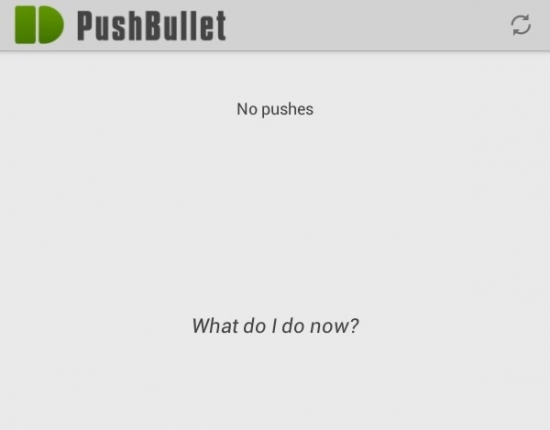 Pushbullet for Android Review | Android Blast! It was always a long process just to transfer files or links from your computer to your phone or tablet. Besides the famous Dropbox, there is a new app that lets you transfer files, url, notes, lists, addresses and reminder to your Android device. This also has the feature that lets you receive stuffs from other devices as well. It is easy to use. You just need you�re the app itself in your phone and the Pushbullet extension for Google Chrome. After that, you need to sign your Gmail account on both your phone and desktop. After signing in, you will see the Pushbullet icon at the top right corner of your browser. Clicking it will push a file, url, notes or address to your device of choice. Pushbullet lets you store to multiple devices. You just need to choose the device that you want to push to. The receiving device will receive a notification that someone has pushed something to it. You can swipe it away to view it later within the app. If you are pushing a file to other device, it will automatically download that file. Any files can be pushed like PDFs, images or videos. The only limitation here is that the file should not exceed 10mb. How does it compare to the popular Dropbox? Well Pushbullet is blazingly quicker. When using Dropbox to transfer files, you need to upload it first to your Dropbox account and download it to your phone or tablet. With Pushbullet, you just need to push it and your device will automatically download that file. For quick files or files which are less than 10mb, Pushbullet is quicker. You also don�t need to be physically near to your device. For files which are greater than 10mb, Dropbox is still the best choice.